The main question I receive for this crochet chevron blanket, and the part that confuses everyone, is the turning when you get to the end of a row. There are two different ways to do this. I prefer to SC2TOG. Other patterns have you skip the second to last SC and just SC in the last stitch. It is your preference. Either way works because we need to decrease on the ends. In my head, I consider the ends the “14th” stitch and is equal to the skipped chains of the valleys. Finished blanket size is approximately 34 inches by 34 inches. I or H size hook. It depends on your personal tension. Guage does not matter, just make sure you like your tension. It shouldn’t be so tight that it feels like a rug, or so loose the cornrows don’t look pronounced. Chain 177 (that is for 6 peaks, roughly 34 inches wide blanket) Pattern repeat is 29 + 3 if you’d like to make it larger. (just multiply the number of peaks you want by 29 then add three. After you have worked the last row of 13 chains, you should have two extra. SC2TOG, these last two stitches. chain 1 and turn. Now, start the next row by SC2TOG, *then work 13 SC, work 3 SC into one stitch (this should be the middle stitch of the 3 SC you did in the row before), work 13 SC, skip two stitches at the bottom for the valley, and repeat *. That’s all a crochet chevron blanket is! I changed colors every 14 rows in this sample, but it is your choice. I plan to work white in between each color change. That’s just personal preference. But buy extra yarn, extra colors, make it your own! 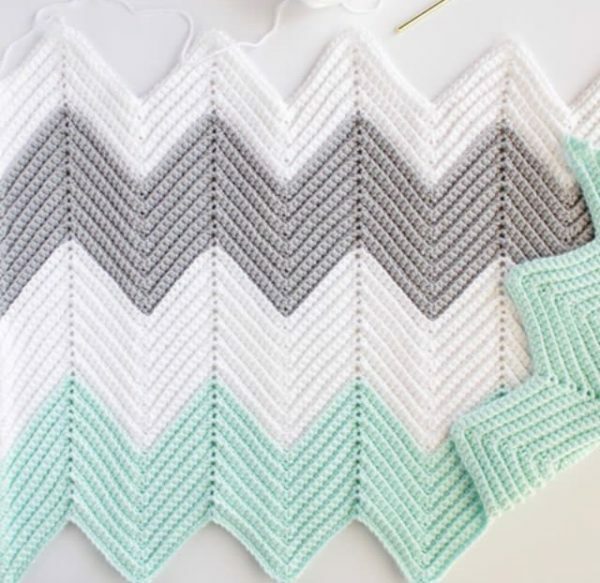 I hope you will be so successful with your own crochet chevron blanket! If you’d like to see more crochet chevron blankets, I’ve made one in navy and coral, and another variation of gray and mint. I have a Facebook page, a Pinterest page, a Twitter account, a YouTube channel all named Daisy Farm Crafts. So come and find me! I do love Instagram the best and I’d love if you’d tag me and share a picture of what you are making. Especially if you’ve mastered the chevron! I’d sure love to see what colors you chose! !